Hiiiiii! How’s the day going? Hope you’re having a lovely afternoon. I loved reading which movies you always watch when they’re on; I know why we’re friends. 😉 I was surprised that Pitch Perfect and Bridesmaids weren’t on there; the quotes never end over here haha. 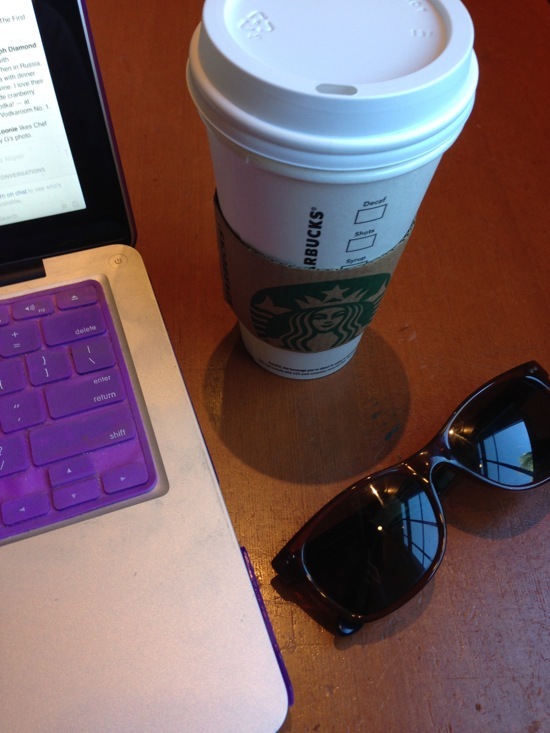 This morning, I had a fun little adventure -I’ll post about it tomorrow, but I tackled a fitness resolution!- and stopped into Starbucks for a tea and to catch up on emails. The detox is still going well! One thing I’ve noticed so far: we have done so much better at minimizing food waste. This is excellent because I haaaaate wasting food. Seriously, I die a little inside each time I throw something away that I forgot about and went bad. 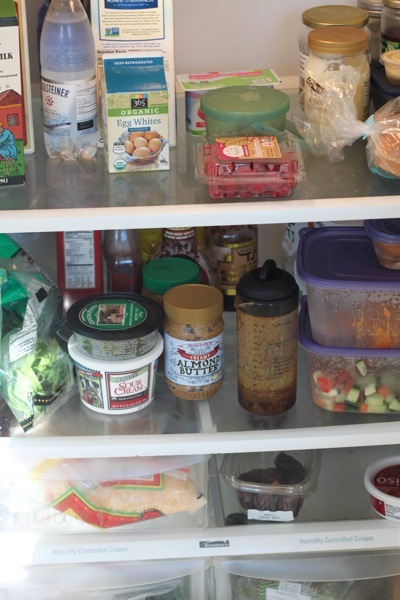 The foods in our fridge are prepped and ready to use, and since we planned so much in advance, we saved a significant amount of money on food this week. Even if some parts of our life return back to “normal” (=gimme my nightly glass of red) post-detox, I think I’ll continue to plan and prep more extensively. The Pilot and I have also noticed how much energy we have without depending on sugar and caffeine. Even with a shaky few nights of sleep, I’ve felt energized and focused, which has been especially helpful with some recent teaching double-dippers. Last night I taught spin + Zumba and it hurt a little get out of bed. It made me laugh that this used to be the standard when we lived in Valdosta. Things change a little over time I guess haha. When I double teach, something that always helps with energy levels: a snack. Lately, I’ve been making a smoothie, or even drinking Shakeology or Daily Burn protein with water, and it’s helped a lot!! So today I have a dumbbell circuit to share featuring one of my favorite training methods: drop sets. Here’s the idea: you start with the first set at a CHALLENGING weight (aka more than you would usually use for that exercise). You perform a smaller amount of reps, and emphasize good form with the heavier weight. (Even though it’s challenging, maintain your posture, breath control and proper alignment.) For the next set, you’ll decrease the weight, and perform a slightly higher amount of reps. For the last set, you’ll do you usual weight and increase the reps. Your normal weight is going to feel extremely challenging! It’s a great way to shake up your strength training routine, especially if you like to perform the same exercises on a consistent basis. 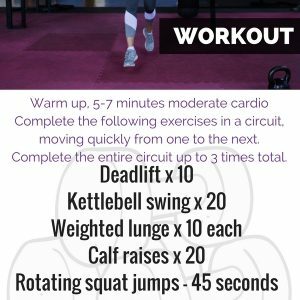 Something to do: Follow up the above strength workout with this killer cardio workout! I can’t believe how warm it is there! Livi looks so adorable and her outfit is killer! I wish I could say that I strength trained more than once per week (sometimes zero). One of my fitness resolutions is to find a more consistent strength routine. i feel like they messed with a perfectly good thing. and totally agree on the cardio mixed with strength! I do not have a green thumb at all so I don’t have any suggestions! Liv is adorable in the garden. I like to strength training 4-5 times a week and do small amounts of cardio. Lately the TRX and battling ropes have been favorites of mine. loving the TRX lately too! A few fun things I like to do with lavender buds–put them in a trivet you make with fabric and batting/insulbrite (when you set a hot pan on them they smell great! ), add to a neck roll (one you sew, or a sock) with rice, heat up in microwave and place on your neck when it’s sore. Make sachets for your clothing drawers by putting them into a small bag or sewing up two small squares of fabric and filling with the buds. i love those ideas! thank you!! Hi Gina! Drop sets are the best. 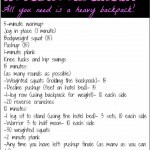 I like this workout a lot and will give it a try. Speaking of teaching, I taught a double-header of BODYATTACK and BODYPUMP last night and the mic went out halfway through my first class. So not only is my body sore today, but also my voice. It happens though. Arg! I have to teach another BODYPUMP in a few hours too. Wish me luck! I usually don’t teach BP two days in-a-row, but I have to this week because I’m filling in as a sub. And yes, I always have extra batteries with me too, but the entire microphone cord/system went out last night – not just the battery, so even that didn’t help. I will probably go lighter in my weight for a few songs tonight for sure. It’s rough! woo done in 20 min! adjusted a bit with weights I had at home but good! I hate wasting food too! The problem is that I love trying new recipes and I’m terrible at finding recipes that have the same ingredients so I’m always buying things and then throwing them out. i love that workout top in your photo! Super cute. Anywho, I usually strength train 3-4 days per week (it’s my fave). 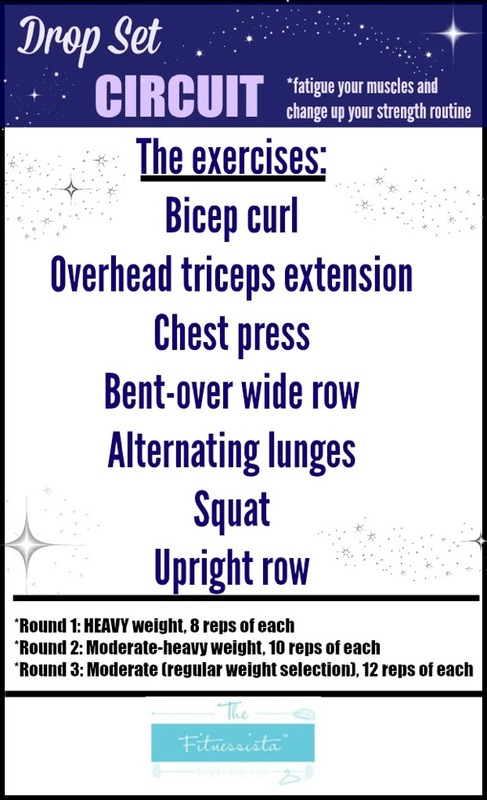 I loveeee using drop sets so I will definitely give this workout a try! I was so worried about the new Teavana teas, but was pleasantly surprised with the mint! I haven’t tried the rest. Lavender and lemon is one of my favorite combos. Have you tried the lavender honey yogi tea? The skin detox (rose and hibiscus) is amazing too if you love floral tasting teas. Should you do all the exercises in a row, then repeat it all w the heavier weight… Or do, say, 3 sets of bicep curls in a row with ascending weights, then move onto 3 sets of the next exercise? Looking forward to trying this out next time I weight train! PS – your dirty 30 has become one of my go to snowday workouts! Totally off topic, but I’ve seen numerous blogs today talking about your book. Is it available for purchase yet and, if so, where can I get it??? look back a few posts ago, it came out a week ish ago I think 🙂 she links to other blogs doing reviews and places to buy it! 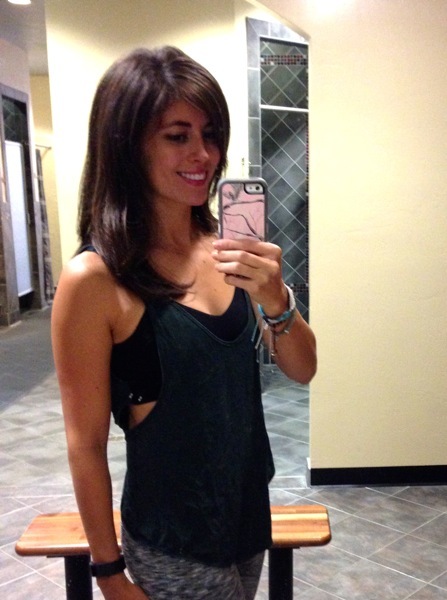 Love your gym outfit! So cute. I’ve been loving strength training lately. After a long hiatus from weights, working at the gym has really gotten be back into the (kettle bell) swing of things. I really enjoy lifting things these days. 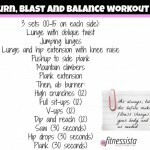 This workout looks great! I like to strength train 3 days a week for arms and 2 for barre. I like to switch it up with TRX and kettlebells. I like to Pinterest new weight ideas. When I was pregnant and in the hospital on bedrest, a friend made lavender cookies for me. I have no idea what the recipe was, and I was totally skeptical, but they were really nice. We just bought a lavender blueberry jam, it sounds weird but it’s amazing. We’ve been eating it with a bit of sharp cheese and the combo is amazing! Also, love the book! I finished it this week and I have about 50 flags marking pages I need to refer back to as I move forward. It’s fantastic. 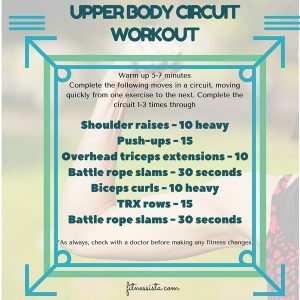 This is a great circuit! Thanks for sharing! I totally get what you mean about double teaching, I’ve started teaching more hours myself and I’m feeling the burn! I love your purple keyboard! lately I’ve been strength training 4-5 times a week in crossfit, getting stronger and LOVING it. the biggest issue has been making sure I’m getting enough protein in my diet.. as long as I keep myself from being too hungry, I’m happy! try using the lavender to make little sachets to put in drawers… its such a treat opening up the inevitable ‘drawer full of crap’ that every house has and having the lovely smell of lavender come out! How about making some lavender sugar hand/ body scrub? Thanks for the drop sets idea! I’ve been needing to mix it up in the strength department! Pinning so I can take a screen shot on my phone later and then use at the gym! drop sets are awesome! they killlllll my muscles! 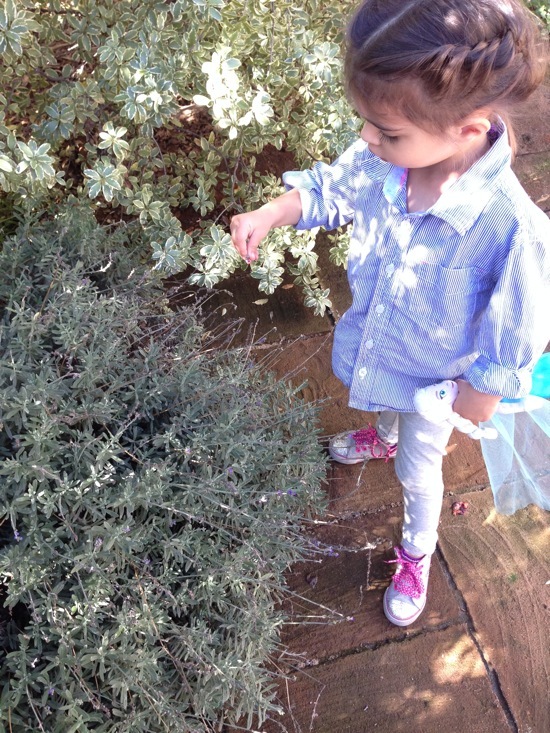 When I was young, we had a lavender bush in my yard. I remember making “smell goods” to place in our drawers with my mom. There were similar to the ones in the video below! I love doing drop sets did a circuit this morning! Also love Livi’s hair – she is just too precious. 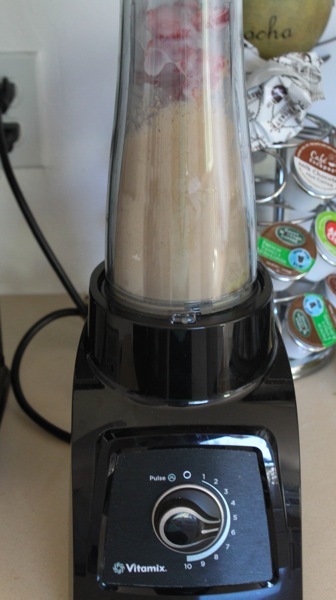 Ooh, a new Vitamix! Do you like the S-series? Easy peasy and so useful to have on hand! i love your hair in that pic! i’m usually a cardio queen but am trying to up my strength training and do a little less cardio. currently reading your book to get some ideas! Agree about the Teavana …. I was sad when trying to order a tea latte & none of the Teavana options seem to sound like they would be any good as a tea latte. I tried the drop sets this morning after a 30 min HIIT It! 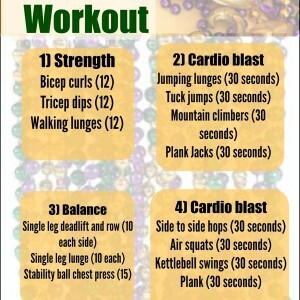 treadmill workout- killer! Awesome combo, Gina! 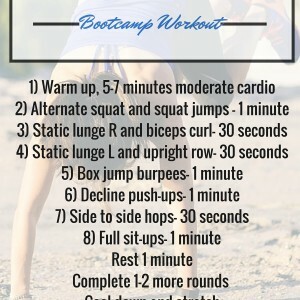 I wanted to stop by and say that I did this workout last night and thought it was great!!! I can already tell that it was a great workout last night.